1. Always make sure that the total rated power of the connected devices is 1000W. 2. Always tighten the Positive (+) and Negative (-) terminals when the inverter is in use, otherwise a loose connection can overheat due to poor contact. 3. Avoid placing the inverter in a location that receives prolonged direct sunlight or near to heat sensitive materials as the inverter can become warm during use. 4. 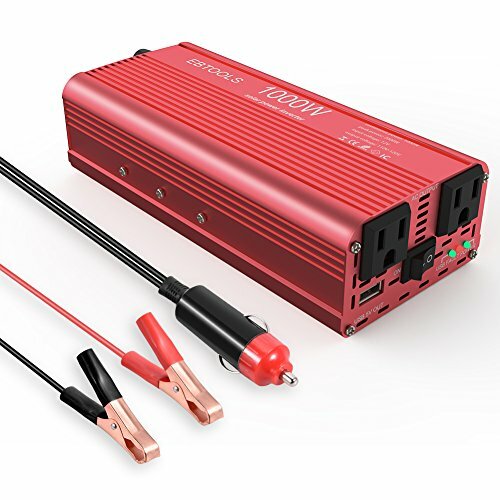 Converts DC power in your 12V batteries in your car, truck, boat or any other DC power sources into the AC power that home appliances, electronics and tools need. 5. If the rated input of any connected AC devices exceed 150W use the included battery clamps to directly connect to your vehicle's battery as most vehicles 12V ports are rated and fused for 150W. It can be used for camping, outdoors, vacations, road trips, remote job sites, and even charging household items. The outlets can power a wide range of power-hungry items on the road. For maximum utility, stay in charge at all times and add this to your travel emergency kit. Built-in replaceable 40A mini slip fuse to protect your devices, easy to replace. Provides safe charging under harsh surrondings and all seasons. Cooling Fan is to keep the unit from overheating. The cooling fan is normally started at 1/3 of the rated power of the inverter. The conversion efficiency will rise after the cooling fan kicks on. [1000W High Power Inverter] - Come with professional and free cigarette lighter and 2pcs battery clips. Provides 1000 watts continuous power, 2000 watts surge power, converts 12V DC battery power to standard 110V AC. (Please confirm your device is in 1000W continuous power). [Multi-Protection and ON/OFF Power Switch] - Built-in 2 replaceable 40A fuses, 1cooling fan. LED indicators display use status of power inverter including over voltage, overload, over-current, under-voltage, overheating, short circuit protection, polarity reverse protection. [Compact and Durable Aluminum Housing] - It is portable to take, durable aluminum body provides advanced protection and easier to cooling. Also come with 2 pieces 23in battery clamp cord, 1 piece 20in cigarette lighter cable. [Unique Outlets Design and Broad Applications] - The outlets are so convenient, it is enough to plug in two larger sized plugs at the same time. Use usb cable to connect car cigarette lighter sockets to power your device. Use a 12V battery system to connect with it to power your device in home or outdoors for emergency, outdoor activities, outage. If you have any questions about this product by EBTOOLS, contact us by completing and submitting the form below. If you are looking for a specif part number, please include it with your message.